Eurometal is successfully using a new SENNEBOGEN 821 E-Series for handling scrap and aluminium. The compact material handling machine moves up to 480 tonnes daily. SENNEBOGEN presented the new SENNEBOGEN 821 M as a reliable all-around machine in 2013. 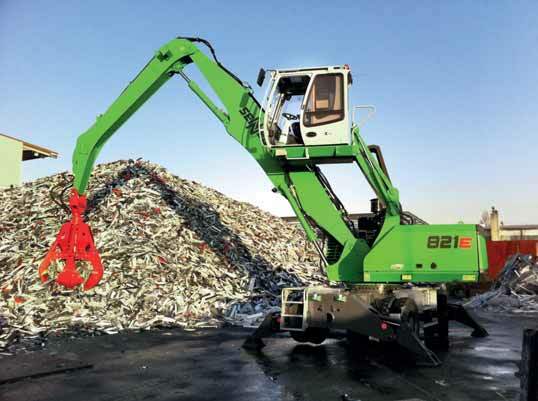 The compact materials handling machine with an 11m reach and 23t operating weight covers a broad implementation spectrum at the scrapyard and recycling site. The French sales and service partner, Sygmat, was able to deliver the first machine of the E-Series to Eurometal near Lyon, at the beginning of 2013. The enterprise, which was founded in 1976, handles approximately 15,000 tonnes of scrap and aluminium waste annually at the site in Meyzieu near Lyon, and for many years has relied on the dependable SENNEBOGEN material handling machines. An 821 of the C-Series was used successfully as a predecessor. The new machine replaces the C-Series machine and supplements an additional 825 Mobile. Equipped with a reliable 97kW Tier 3b engine and all-wheel mobile undercarriage, the compact material handling machine is flexibly on the move over the entire site. The new 821 really shows its strengths in indoor use, for charging the scrap press. With a rear radius of only 2.42m, and a width of 2.55m, the machine stays compact and manoeuvrable. Operators and the responsible parties at Eurometal have particular praise for the comfortable, Maxcab, available for the first time in this machine class, and which can be elevated to a viewing height of 5.80m. In addition, the new machine generation is impressive with the best noise values. Compared to the predecessor machine, noise emissions have been reduced by as much as 50% — an important criterion, particularly for indoor use. The machine sets new standards in terms of fuel consumption and operating costs. The 821 M loads and sorts the arriving materials at two cycles per minute. The customer’s first internal measurements confirm consumption of under 9 litres per hour — a value that significantly exceeded the customer’s expectations. The new SENNEBOGEN control system, SENCON, supports the operator in daily operation. Idle stop automation and ECO Mode save fuel. In the Optimode of the SENNEBOGEN 821, adjustments can be made for each area of implementation so that the machine can work at the highest level of efficiency. In combination with the optimized engine controller, savings of up to 25% are possible.